We now have data plans for our phones giving us mobile internet access, why not have one for our cars? GM and AT&T announced on Monday, at the Mobile World Congress in Barcelona, a plan to integrate 4G LTE Services in GM's cars in partnership with AT&T. The first of GM's vehicles to get integrated 4G LTE support will be 2015 Chevrolet, Buick, GMC and Cadillac models available in 2014 in the United States and Canada, with wireless Internet connectivity delivered through AT&T. The company will announce more carrier and supplier relationships in coming months to expand 4G LTE capabilities in markets around the globe. The 4G LTE support will be similar to that we have in phones, offering mobile Internet access. This will enable a wide range of in-vehicle communications and entertainment capabilities in GM's vehicles. The company expects benefits could include in-vehicle Wi-Fi hot spots, new infotainment options like streaming video entertainment in the back seat, real-time updates and faster application downloads. The addition of 4G LTE will build on OnStar’s existing portfolio of built-in connected services. The service will be specifically designed to work in a car or truck, will be powered from the vehicles 12 volt system, and will include an external antenna to maximize coverage and connectivity. Owners of these cars will not be required to own a smart phone to take advantage of the system, instead it will be built into the car's infotainment system. Over time the high speed wireless connectivity will also enable vehicles to interact directly with their environment to enhance safety, efficiency and convenience for drivers and passengers. The "connected car" and "intelligent transportation systems" concepts rely on data communication between vehicles (vehicle-to-vehicle) as well as to the transportation infrastructure. It's expected over the years that these sorts of features will enable more autonomous driving features. GM and other automakers are working with U of Michigan researchers on connected vehicle research using vehicle-to-vehicle communication, and aiming to reduce or eliminate traffic jams, traffic accidents, increase the efficiency of driving, reducing fuel use, and usher in a wave of robotically driven cars. 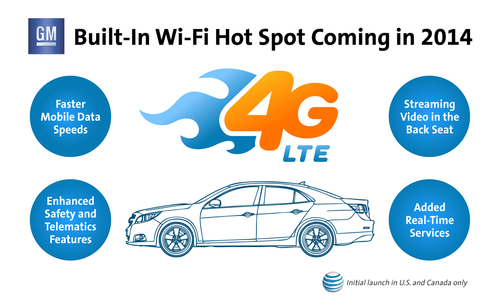 GM and AT&T say they will begin immediately to work on 4G LTE connectivity for GM vehicles in the U.S. and Canada. This is the same network used for AT&T wireless telephone customers today, and covers over 300 million people. GM and AT&T will also work together on a broad ecosystem focused on developing new communication applications to enhance the driving and riding experience. This will also enhance the developer platform for 3rd party infotainment applications that GM announced in January. That platform includes In-Vehicle API's for applications hosted in the OnStar system. Best app for this is an app called Tele-Traffic. Hands free traffic app. Amazing stuff here in FL, and it looks like they will be expanding.